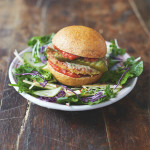 I am super excited to be sharing the recipe for Mega Veggie burgers from Jamie Oliver’s new book Everyday Super Food – recipes for a healthier, happier you, which is published today. Serve with my aubergine chips! 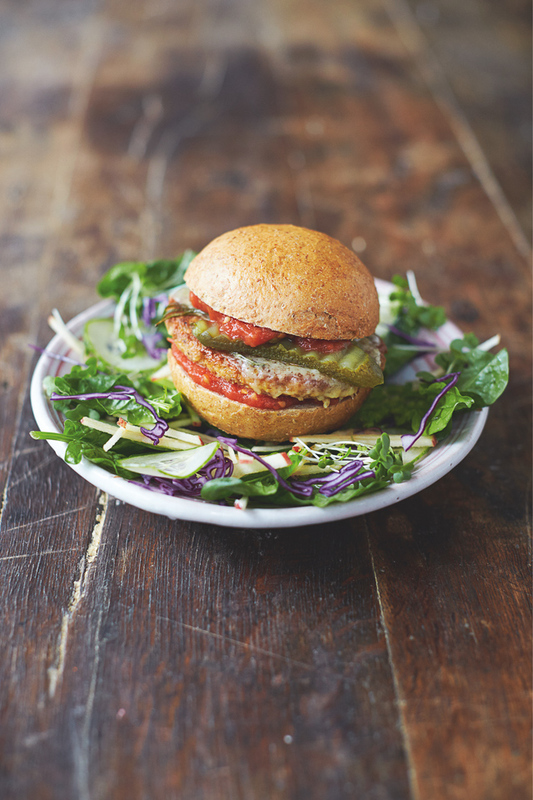 If you try this Recipe: Mega Veggie Burgers by Jamie Oliver please tag #FussFreeFlavours on Instagram or Twitter. It is amazing for me when for me when you make one of my recipes and I really do love to see them. You can also share it on my Facebook page. Please pin this recipe to Pinterest too! Thanks for reading Fuss Free Flavours! Wrap the tofu in a clean tea towel, then squeeze and wring it out to remove the excess liquid (about 4 tablespoons should come out – it’s messy, but really important to do this for great burger texture later). Place the tofu in a bowl, scraping it off the tea towel. Crack in the egg, then add the breadcrumbs and Marmite. Mix and scrunch together really well with clean hands, then shape into 4 even-sized patties that’ll fit nicely in your buns once cooked. Roughly chop the tomatoes and put into a dry non-stick frying pan on a high heat with a pinch of black pepper, a splash of water and the vinegar. Squash the tomatoes with a potato masher, cook for 10 to 15 minutes, or until thick and delicious, then tear in the basil leaves and season to perfection (I sometimes add a pinch of dried red chilli flakes too, for a kick). If you want to plump up your buns, pop them into a warm oven for a few minutes. Meanwhile, finely slice or prep all the salad veg. Next, pick the basil leaves into a blender and blitz with all the other dressing ingredients and a pinch of salt and pepper until super-smooth. Place 2 teaspoons of oil in a large non-stick frying pan on a medium heat. Pick the rosemary leaves into the pan in four piles, place the patties on top and cook for 3 minutes on each side, or until golden. Slice or grate the cheese, place on the patties, reduce the heat to low, then cover and leave to melt for 3 to 4 minutes. Spread the tomato sauce into the buns, then sandwich the cheesy burgers and sliced gherkins inside. Toss the salad with half the dressing (save the rest for another day), serve alongside the burgers and enjoy – totally awesome.